THEN: The 45th Street Theatre sometimes ran contests with prizes running from sacks of groceries to a new Buick. Courtesy Stan Stapp. NOW: A recent photo of the Guild 45th taken by Jean Sherrard with his trusty extension pole. 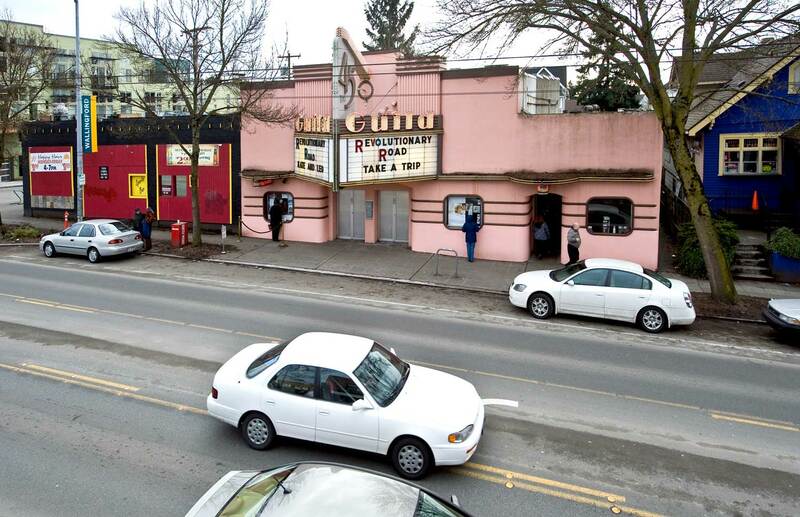 When Wallingford’s Guild 45 Theater opened in 1921 as the Paramount, it was but one of scores of new smaller venues bringing Hollywood and in some cases even vaudeville to the city’s neighborhoods and suburbs. The Paramount’s first owner, William Code, lived on Burke Avenue, a block off of Wallingford’s “Main Street,” 45th Street. North-end historian, now deceased, Stan Stapp remembered W. F. Code Well. Code could be counted on to run a big ad on Page 2 of The Outlook, the Stapp family’s community newspaper. During the first years of the Great Depression, the Outlook took fistfuls of theatre passes as interest on Code’s mounting advertising debt. After Code moved to Alaska, the family continued to fantasize that he would someday send back the cash – more than $2,000. He never did. The Paramount’s second owner, Bill Bruen, changed its name to the 45th Street Theater in 1933. Stapp remembered that Bruen ran a popular Depression-time promotion featuring an on-screen animated race between horses numbered 1 through 10. The last digit on the moviegoer’s ticket stub was their 1-in-10 chance of having a winner. When the 500-seat house was filled there were 50 winners, and each took home a sack of groceries. The Theater’s third owner, Jack Neville, was also a manager for Davison’s Wallingford Appliance Center, another commercial landmark on 45th. 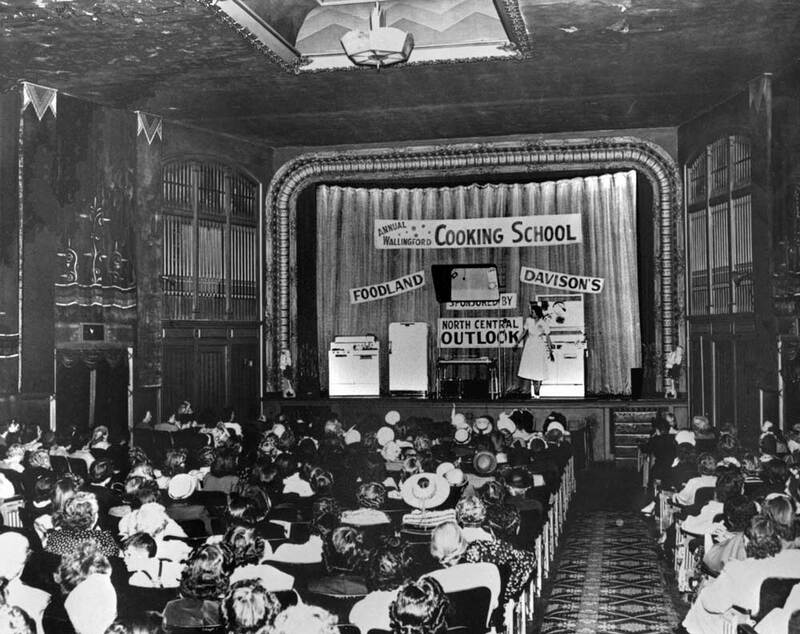 With the Outlook, Davidson’s appliances, and the then new Foodland (see accompany blog story on Foodland) Neville ran an annual Cooking School on the stage of the 45th Theatre. 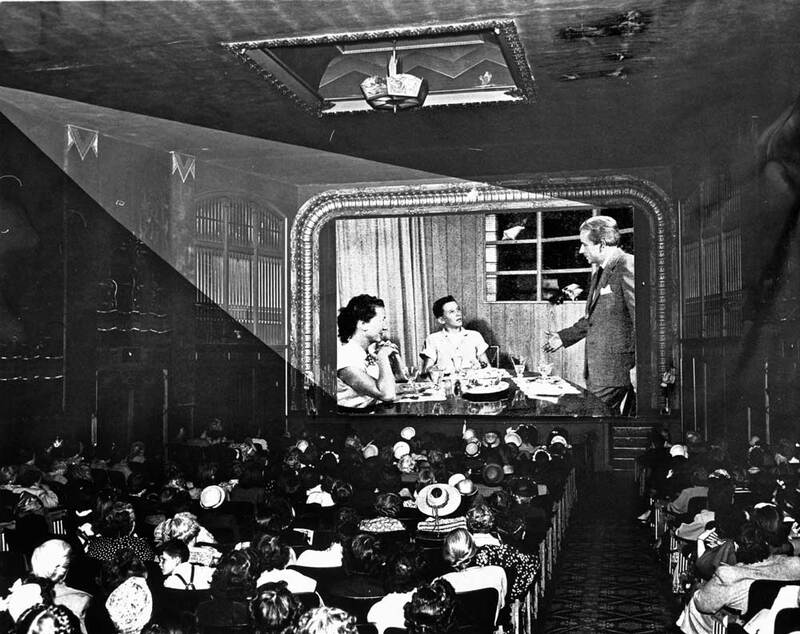 Increasingly, neighborhood theaters were required to come up with innovative programming to stay lit. 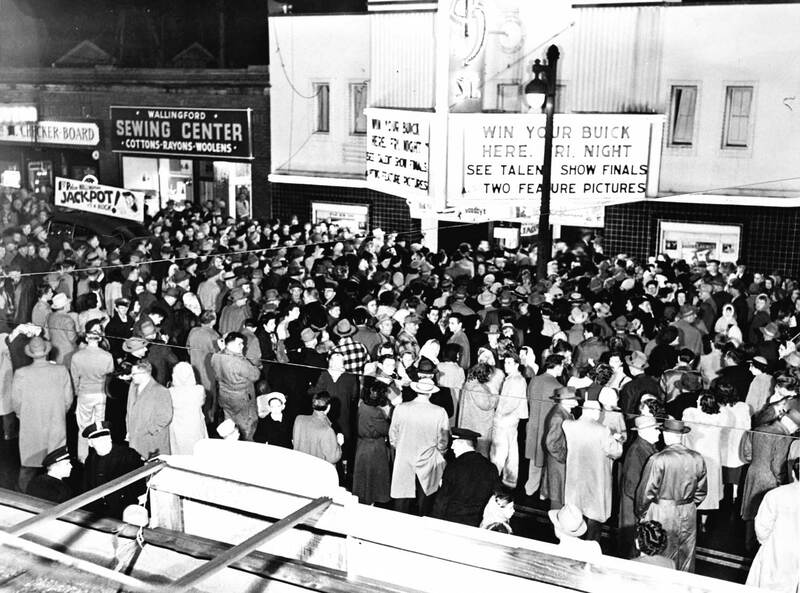 The 45th Street Theatre ran a variety of contests with local merchants including a north end Buick dealer, a big prize that filled the street for one of the theatre’s raffles. 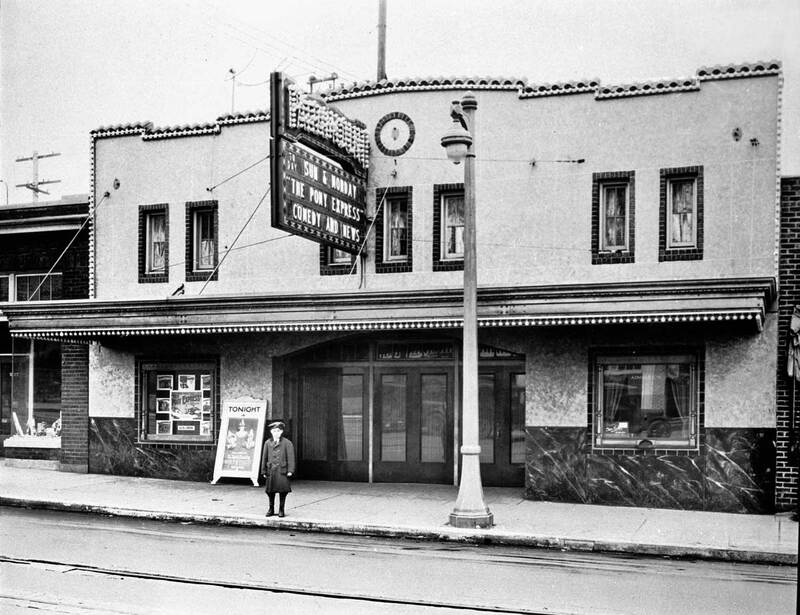 As an employee of Saffles Theater Service, Bob Clark had been booking movies for Neville’s theater long before he bought it from him in 1955 to become its fourth owner. Soon the theater’s remodel and name change to Guild 45th prepared it for a life of mostly foreign films. The anxieties of some of the Guild 45ths neighbors over its bearded clientele were unfounded. One index of audience “attitude” is slashed seats, and at the Guild the incidence of knifed cushions dipped dramatically with the new art-house policy. In 1957 Bob Clark added The Place Next Door. With an espresso machine imported from California, a French menu (patisseries, gateau and comestibles) folk signers, abstract art and an underground décor featuring a brick wall artfully ruined to suggest the French underground; Clark opened one of Seattle’s first coffee houses. He even dressed the part: beret, red shirt and white ascot. The Store Next Door became especially authentic as a post-beat Hootenanny era coffee house when Folksinger and Folklorist Stan James (click to visit another corner of this blog where his life is remembered and celebrated) managed it in 60s and re-named it the Corroboree. Bob Clark’s art house tradition went with the Guild 45th when he sold it in 1975 to Randy Finley. The fifth owner’s decision to stick with the art-house repertoire did not require much reflection. By then the Wallingford neighborhood was brimming with the “educated classes,” many of them associated with the near-by University of Washington. Wallingford’s gentrification came with a long reading list and a taste for things foreign. In 1983 Finley added a smaller Guild 2 two doors west. 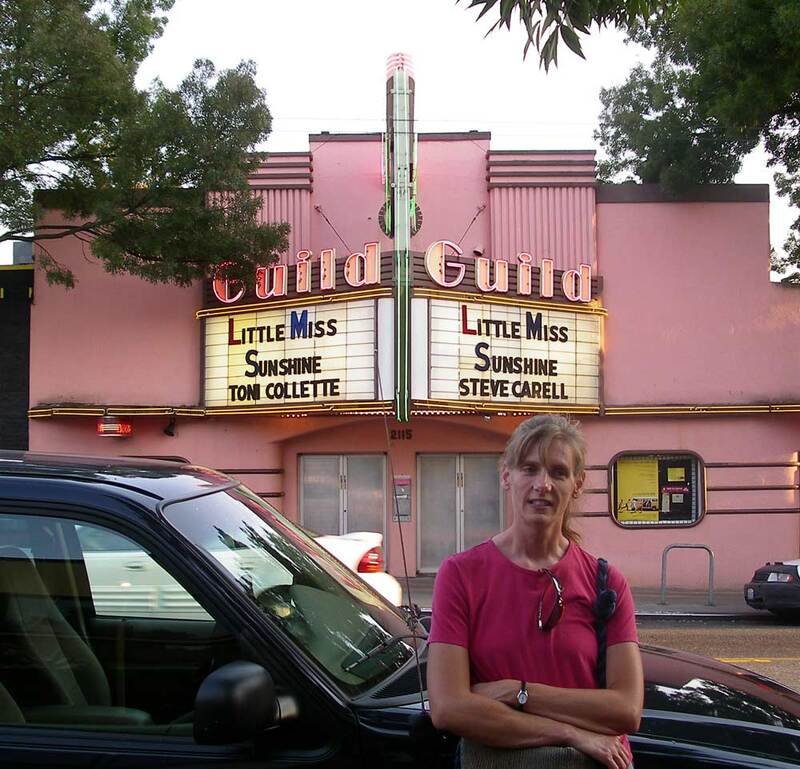 Booking the modern Guild 45th was made even easier in 1988 when it and most of the rest of the Seven Gables Theatres previously put together by Finley were purchased by Landmark Theatre Corporation, a national movie-house chain. For the interior view showing the projection of a film - probably with a family cooking theme - the Outlook used the same still as the base for imposing its sort of life-like projection (see below). Little Miss Sunshine, an example of one of the recent non-foreign but still "edgy" films shown at the Guild 45 and taught by European examples. I worked there from 1985 to 1986. There was a strange/creepy little apt behind the concession area that looked as if it had been sealed off in the 1940s. They used it for storage. The roof was also prone to flooding the first few rows in really heavy rains too. The projection booth could get stiflingly hot in the summer and freezingly cold in the winter too. The staff (except a few of us) were all out to lunch too. Amadeaus was the film that was running when I started there, then Mad Max Beyond Thunderdome, Sweet Dreams and several foreign (i.e. Arthouse) films too. I saw several famous folks during Sneak Previews of upcoming films too including David Byrne and Ned Beatty. I used to be sent to the Saturday matinees to give my mother some rest, I guess. Wth my cohort I’d watch enthralled the adventures of the Dead End Kids and the Bowery Boys, every one a cliffhanger. I can still recall the end of a few, especially the one with the air compressor’s pressure gauge climbing through the danger zone as the kids sat on a fir escape hiding from the bad guys. Howard Hawks’ arial adventure film with a beautiful aviatrix left an endurable impression, although I can no longer recall the title. Maybe it was what inspired me to spend exactly one third of a century at the Boeing company.